Microwave radiometers measure the thermal radiation of the atmosphere, which provides information about the water-vapor and liquid-water content. Also temperature profiles of the lower troposphere can be inferred. Typically, microwave radiometers are not sensitive to the thermal radiation of ice. 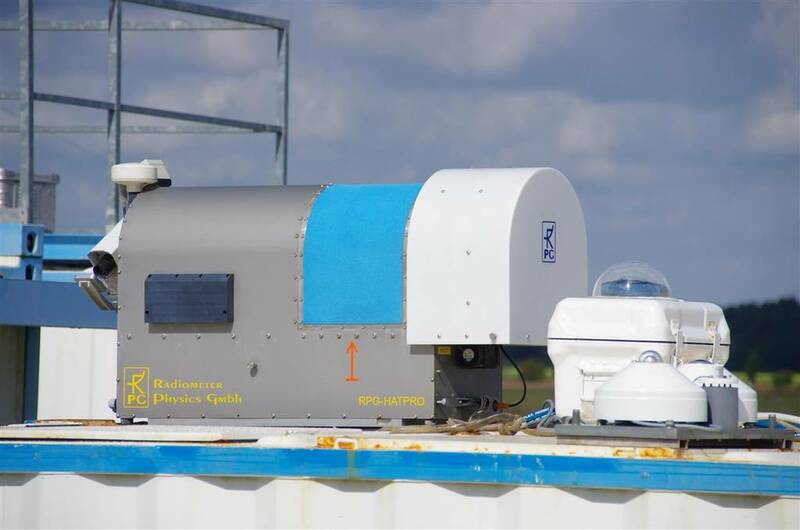 Thus, only information about the water-vapor and liquid-water content are retrieved, which can be used for the investigation of mixed-phase clouds. Microwave radiometers are key devices of LACROS and Cloudnet to identify liquid water clouds. Therefor they are also central instruments for the investigation of aerosol-cloud interaction. Microwave radiometers measure the thermal radiation of the atmosphere. When appropriate detection frequencies are used, the emission of microwave radiation of atmospheric trance gases, of liquid water, and of ice crystals can be measured. The emissivity of these substances, and thus their radiative temperature, depends on the concentration, the air pressure and air temperature. When the radiative temperatures are measured in frequency bands which in particular depend on these parameters, they can be estimated. Between frequencies of 20 and 30 GHz an absorption band of water vapour is located. measurements of the radiative temperatue on the flanks of this absorption band allo to estimate the integrated water vapour (IWV) content and a profile of absolute humidity. Between frequencies of 50 and 60 GHz an absorption band of oxygen is located. Because the relative concentration of oxygen is constant and depends only on pressure and temperature, measurements of the radiative temperature at the flanks of the oxygen-band allow to estimate profiles of the air temperature. The total emissivity of the atmosphere in the range from 20 to 60 GHz depends in addition to the total amount of liquid water in the atmospheric column. This property is used to estimate the liquid water content. TROPOS operates two microwave radiometers of the type 'Humidity and Temperature Profile' (HATPRO) (see Fig. 1). One instrument is part of the ground-based surface station LACROS, wheras the second one is operated in the framework of the OCEANET-Station. Both instruments run continuously and provide important information about the amount of water vapour and liquid water in the atmosphere.